Though I am sure that I have had Christmas fruit cake before I did not really remember it. Given that and the controversy around fruit cake when I saw some posts about Christmas cake I knew that I would have to try making one to find out. All of the recipes that I saw called for making the cake a few weeks ahead of time to let it mature. Many of the recipes called for “feeding” the cake brandy on a regular basis while it matured. I did not want my cake to end up being too heavy with brandy so I decided to just soak the fruits in some brandy and then I wrapped the cake in cheese cloth that was soaked in brandy while it matured. Some of the recipes that I came across called for adding a layer of marzipan and a layer of icing but I wanted to keep my fruit cake nice and simple so I skipped the frosting layers. After waiting for over a month I finally unwrapped the fruit cake to try today. I am not really sure why fruit cakes have such a bad wrap as this fruit cake was really good. It was nice and moist and full flavour! The cake had a hint of booze without being overwhelmed by it. I think that I will be making a Christmas fruit cake again next year. Nice work! I often find fruit cake too “boozy” for me, although my dearly beloved does love it. It is very heavy, and I’ve never seen it frosted, because it’s moist enough, and I guess you wouldn’t want it heavier. Yours is beautiful, Kevin! Just catching up on my blog reading after several days away – hopefully my life will go back to normal soon! Anyway, my parents had friends that exchanged the SAME fruit cake for over 30 years back and forth – I may have to try your recipe though! The cake looks so colorful and moist. I had no idea that you let the cake mature, that seems so strange to me, but I guess it worked out great. Merry Christmas Kevin..That fruit cake says it all. I just made my fruit cake today with lots of marzipan inside the cake. Yours look so nice and moist. Delicious as always. Thanks for the lovely recipe Kevin and I am going to try it soon. This looks divine! What a beautiful cake to celebrate Christmas! I love homemade fruit cake but not the store bought kind. I think the store bought kind are way too sweet. I just love your fruitcake. It look prefectly moist and just the right amount of fruits in it. Merry Christams to you Kevin. I’m impressed by your blog and foods you make! I’m bookmarking now. Have a wonderful holiday, Kevin! I love fruit cake, but I have never made my own. Yours looks fantastic kevin. Enjoy the holidays! That looks so pretty! I never knew fruit cakes could keep so long. Btw.. Sears at Eaton centre does not have Chicago Metallic, but they do at Winners, although I hate searching through the madness there. I have actually had a few friut cakes that I really enjoyed. I think a lot of it depends on the quality of the ingredients. I want to make one with dried fruits instead one day, then I think a glaze would be appropriate. Yours sounds very nice. I think fruitcake is just kind of unusual and aggressive, and not really to everyone’s taste. But I do love fruitcake, and yours looks excellent! Lovely looking cake Kevin – Happy Christmas to you! Merry Chtistmas and Happy Holidays! your fruit cake look great! I also bake a fruit cake for this Christmas but not as pretty as your!..Merry christmas to you!! Wow…the cake looks fabulous!!! Wish you and your family a Merry Christmas. I hope you don’t wait until next Christmas to make it again Kevin, it sounds yummy! I admit, I am kind of a fruitcake hater. They just don’t seem appetizing. Making it yourself? That sounds a little better. I think I really liked the fruits you used in this version. Maybe next year I will have to give it a go. Merry Christmas! ooo..I posted Christmas fruit cake as well! Your fruitcake looks and sounds very good. Haven’t ahd fruitcake in a long time. That Fruit Cake looks like something I would actually want to eat! Yours looks great! Time to change fruit cake’s reputation. Merry Christmas! Your cake looks delicious! The fruitcake sounds terrific and your photo is stunning. Kevin – Merry Christmas to you! Thanks for all your wonderful comments on my blog. And yes, this would be a fruitcake I would eat with a bit of cream cheese on it. Most of the fruit cakes I’ve had over the years have been pretty dry or way to sweet for me. If this makes a moist version, I might eat it. Merry Chirstmas Kevin! And a Happy New Year Too!! Now that looks like a fruitcake anyone would love! Happy holidays! Mmmm. Looks really good Kevin. Happy holidays! it’s a fantastic blog. Good job keep it up…..
What a beautiful fruitcake ! I’ve tried a couple of other recipes but they didn’t slice well, whereas yours sliced very neatly. BTW Kevin – what size baking pan did you use for this recipe ? I’m so glad I stumbled upon your blog. Thanks for sharing…Bookmarked! Anonymous: I used a 9 by 5 inch loaf pan and I had enough left over for an additional 4 inch diameter circular baking pan. My English friend came over with fruit cake, it was super moist like your. The recipe called for 12 cups of flour. That’s a lot of fruit cake. I was thankful that she shared. Thanks for the link Kevin – I also had planned to ice it and thought it was really rich enough with adding icing. I just don’t like candied fruit, so I make fruitcake with dried fruit only. But no objection to fruitcake in and of itself, and lurid red cherries aside, yours looks pretty darn good. I just love the way your fruit cake looks. I am a fruit cake lover.. anytime.. inspite of the strange look I get when I say that. I recently made panettone, the Italian Christmas fruit cake (http://www.ztastylife.com/2009/11/panettone-italian-christmas-fruit-cake.html). This year I think I'll also attempt the english Xmas steamed pudding (I need to start now). Hope you like this version too. Fantastic! 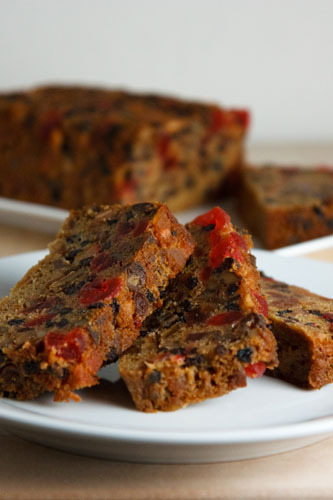 I have been looking for a Christmas fruit cake recipe and this one's perfect! Anonymous: Tea would work for keeping the cake moist and tender and infuse it with flavour. Keep in mind though that the alcohol also acts as a preservative and this allows Christmas cakes to last for long periods of time. Without the alcohol I am not sure how long the cake would last. Juices like apple juice would also work. Kevin, my mother made fruit cakes for years and never put any alcohol in them and they would stay for months if she hid them!!!! She used a recipe from Wesson Oil called of all the Wesson Oil fruit cake from way back when. She usually made them in a tube cake pan and made 8-10 every year. I think you would like this one!!!! This was a great recipe – glad to have found it (and your blog)! Happy New Year! My mum made that cake every birthday while I was still young enough for Christmas parties and when my son was born she made one and brought it over. In Israel they have what is called 'English cake'!!! What a laugh. Half an ounce of raisins makes an English cake. Next year I'll try your's since it is to late for this year. I have already started on my baking. Every year I use to try new recipes of fruit cakes to give for Christmas and than I got to busy to bake. I am now retired and have plenty of time to cook. This was the best recipe I have ever made for fruit cake, so moist. I replaced the brandy with spiced rum and we all loved it. Forever in my favourites. thank you! Very similar to the cake my Mom used to make, except she used Burgundy wine for the liquid. When it was cooling, she poured more wine over the cake, wrapped it in waxed paper and foil and stored it in the coolness of the jam room in our basement. She would make about a dozen a year. What size pans to use? I use a 9×5 inch loaf pan but you could use other shapes of pans. Enjoy!